Red Dawn seems like a good movie on the surface, but later you realize that the plot actually has more holes than Swiss cheese. Think of how on Halloween, you love eating delicious candy, but the next day you have a stomach ache; suddenly, you're thinking maybe that candy wasn't that great after all. When you are watching Red Dawn at first it seems like an awesome action movie; but when you think about what the plot is actually about, you realize that it's very farfetched. The original Red Dawn was released in 1984, and 2012's version has a similar plot. This version was also filmed in 2009, pre-Hemsworth's Thor and Hutcherson's Hunger Games box office successes, and it was filmed in Michigan. Jed Eckert (Hemsworth) is back home in the Seattle area on leave from Iraq, and his brother, Matt (Josh Peck), a high school football player, isn't really excited to see him. The next day, the boys are awakened to the sound of airplanes in the air: there's some sort of invasion going on. Their dad (Brett Cullen), a local policeman, urges them to escape to their cabin, and he stays to fight. A bunch of Matt's friends follow them up to the cabin too, but soon the North Koreans - the people that have invaded Washington - find them. Jed, Matt, and their crew form the Wolverines (based on their high school's mascot), and they are determined to overthrow the invaders, save Matt's girlfriend, and bring peace back to their city, before it's too late. Throughout this whole movie I was thinking that the North Koreans probably aren't going to be pleased with this film. There's some Russians helping as well, yet in the original Red Dawn, the enemies were the Soviets, Nicaraguans, and Cubans who invaded. The reason that the North Koreans invaded is never really explained, except that at the beginning of the movie there are many clips, some including Obama, talking about them and what they have done recently, and about U.S.-North Korea relations. So ... okay, then. The North Koreans invade, and it's said that other states are still "free" - so where was the U.S. military? 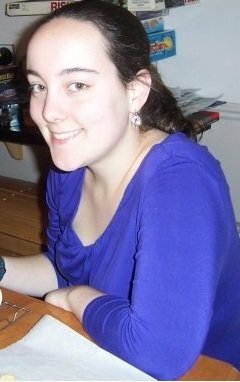 The only states that had been taken were the coasts - the East Coast and the Seattle area ... I guess the other states just didn't want to help out? There's another scene where Hutcherson's character and his allies burst into a crowded Subway shop, and see that they have food. He yells: "Sandwich artist! Fill this bag!" and throws a garbage bag at the Subway employee (one of the funnier lines in the movie, actually). However, that scene also confused me, because the film gave the impression that everyone was either under lockdown or had been taken to one of the camps that Matt's girlfriend was in (think internment camp, for the most part) - and the movie doesn't explain how some people are still free to roam about, either. Acting-wise, the movie is fine. Hutcherson could have been used more, but he's a friend of Peck's in the movie and doesn't get much screen time. Josh Peck, who is best known for the TV show Drake and Josh, made a quick appearance at the beginning of the Red Dawn screening I attended, saying how he loved filming in Michigan and going to the Somerset Collection in his free time, but there was no Q&A or anything after the show. Peck and Hemsworth are both good in this film, though it's Hemsworth's character that's in charge, since he has military experience. Jeffrey Dean Morgan also has a small part as a Marine that meets up with the Wolverines, as he and two other ex-Marines are trying to rebel against the North Koreans as well. Maybe see this film. The action scenes are great, and the film is mostly action; however, I wish they had chosen a better/more realistic villain for the Wolverines to fight. The movie is a little sobering, as well, because it's crazy to think about what would happen if terrorists did invade U.S. soil like they do here. The film also employs the "shaky cam" technique, which I am not a fan of, especially since I was sitting near the front of the theater, but I will admit it does make the film seem more "realistic," as it shows us the characters' perspective as they are running or fleeing a scene. 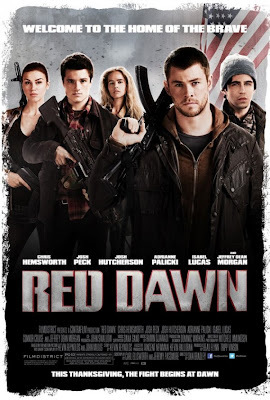 Red Dawn is not the worst movie out right now but if you do choose to see it, you might find yourself wondering afterwards what the film you just saw is actually about. Red Dawn is currently playing in theaters and is rated PG-13 with a runtime of approximately 95 minutes. 3 stars out of 5.